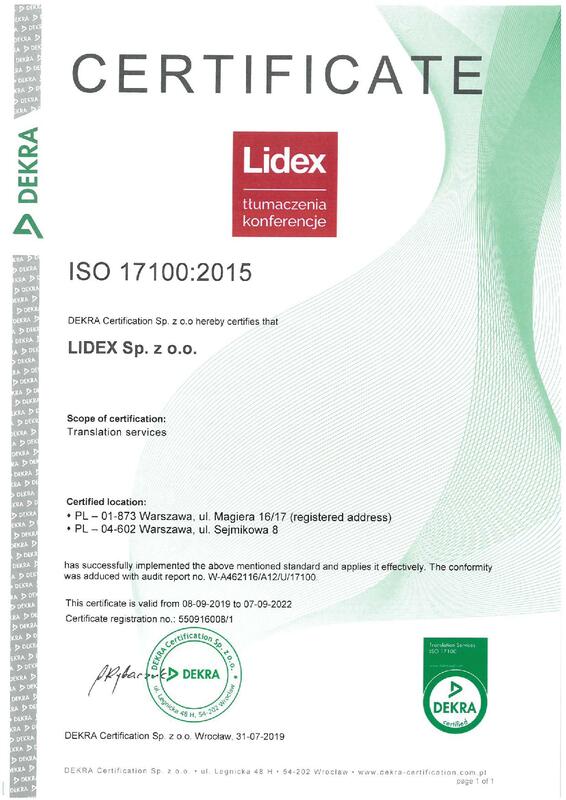 If information security is your prime concern, LIDEX is a holder of a third class industrial security certificate (domestic, NATO and EU); a large number of our interpreters also hold security authentications. 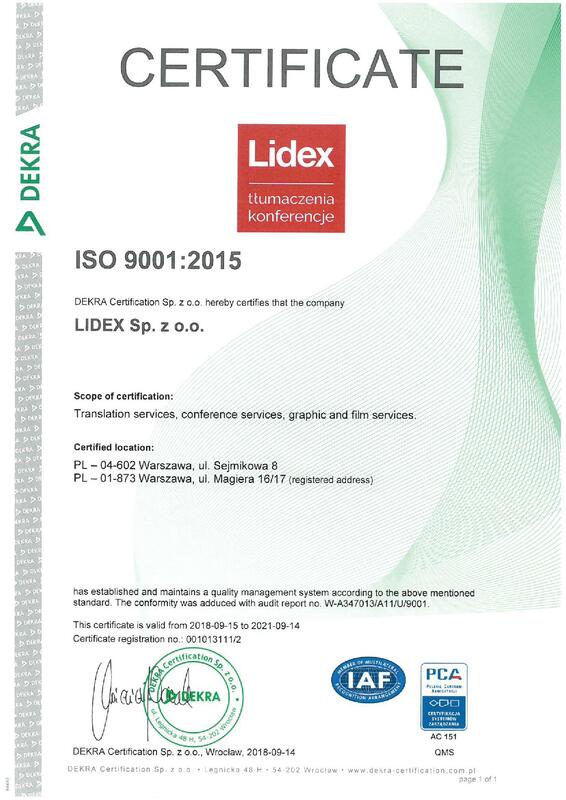 The LIDEX Translation and Conference Centre guarantees that its interpreting services are of superior quality. We have been present in the translations business for30 years and we are perfectly well acquainted with the dynamically shifting interpreting market. We provide simultaneous interpreting services in all locations in Poland for government institutions, international corporations and public benefit organisations as well as for the purposes of translation of public speeches or live coverage on television. We also have our own simultaneous interpreting systems (including interpreter booths) as well as infoports (portable simultaneous interpreting systems to be used without interpreter booths). 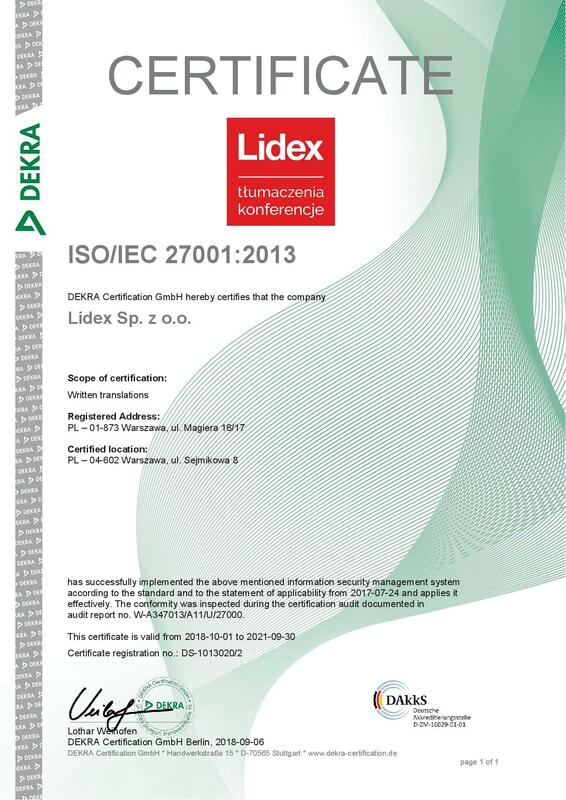 The LIDEX Translation and Conference Centre offers not only the services of simultaneous interpreters, but also interpreting systems, booths, additional audiovisual and sound systems – along with transportation, assembly and service. GUARANTEE OF ORDER PERFORMANCE Place an order and enjoy the peace of mind. Whether you need interpreters proficient in Persian or Chinese, language support for an international medical congress or a meeting dedicated to new technologies, or interpreting with live online streaming – that is also no problem at all. We will handle every request that you may have. We guarantee that our interpreters are always up to the task. WE WORK WITH THE BEST POLISH INTERPRETERS What does it mean, exactly? You can feel reassured that they possess both exceptional language skills and an excellent grasp of the issues involved. They can cope with the stress and are able to respond immediately to the dynamic changes in the surrounding circumstances. Our interpreters are able to deal with a variety of speakers, regardless of their cultural background. Take advantage of our services and feel the difference. EXPERT ADVICEWe will provide you with advice and select the interpreters who are most suited to the task at hand. We know what selection criteria to apply, depending on the translation scenario involved. Our Customers put their trust into our decisions. In the meantime, we follow the development of new sectors and specialisations to extend the range of services and pool of available interpreters. Ask for a quote – the selection of the optimum interpreter for the given task is included in the price.